Here comes another amazing robot from Boston Dynamics . PETMAN is the name given to this wonderful anthropomorphic robot. This will be used for testing special clothing used by US military personnel. 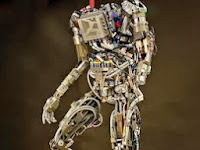 Amazing body balance: robot balances itself as it walks, squats and does calisthenics. Simulates human physiology by controlling temperature, humidity and sweating inside the clothing to provide realistic test conditions. It can be used to test the performance of protective clothing designed for tackling hazardous environments. The video shows initial testing of PETMAN in a chemical protection suit and gas mask. For more information about PETMAN anthropomorphic robot by Boston Dynamics visit their website at www.BostonDynamics.com.